Sepsis in a newborn is a serious and potentially life threatening condition. Currently, there are varied approaches to identification and management of at-risk infants. These approaches differ in defining at-risk infants, predictive value and timing of laboratory tests, antibiotics prescribed for treatment and duration of antibiotic administration. This variation introduces the potential for less than optimal quality of care, excessive or unnecessary exposure of newborns to antibiotics and higher costs of care. Neonatal exposure to antibiotics is not without risk. The CDC estimates that nearly 50% of antibiotics are unnecessary or suboptimally effective as prescribed; multiple literature sources have demonstrated an increased risk of necrotizing enterocolitis (NEC), nosocomial infection and mortality with neonatal antibiotic exposure. Current literature suggests Antibiotic Stewardship programs are beneficial in optimizing pharmacokinectics of medications, reducing adverse effects of antibiotic exposure and antibiotic resistance, enhancing successful treatment of infection and improving patient safety. • Providing the education and support necessary to develop standards of care for identification and management of infants at risk for early onset sepsis in NC hospitals. • Engaging families to further provide further education on the necessity and appropriate use of antibiotics. 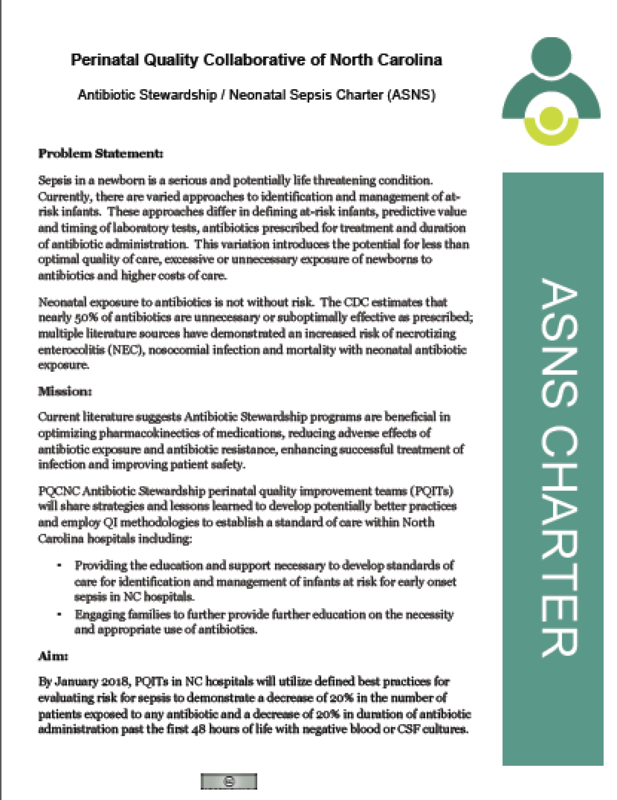 By January 2018, PQITs in NC hospitals will utilize defined best practices for evaluating risk for sepsis to demonstrate a decrease of 20% in the number of patients exposed to any antibiotic and a decrease of 20% in duration of antibiotic administration past the first 48 hours of life with negative blood or CSF cultures.